You asked for it so we delivered! Not only did we deliver, but we also partnered with one of the top pre-cut designers – It’s Sew Emma! Our motto? Keep it simple! 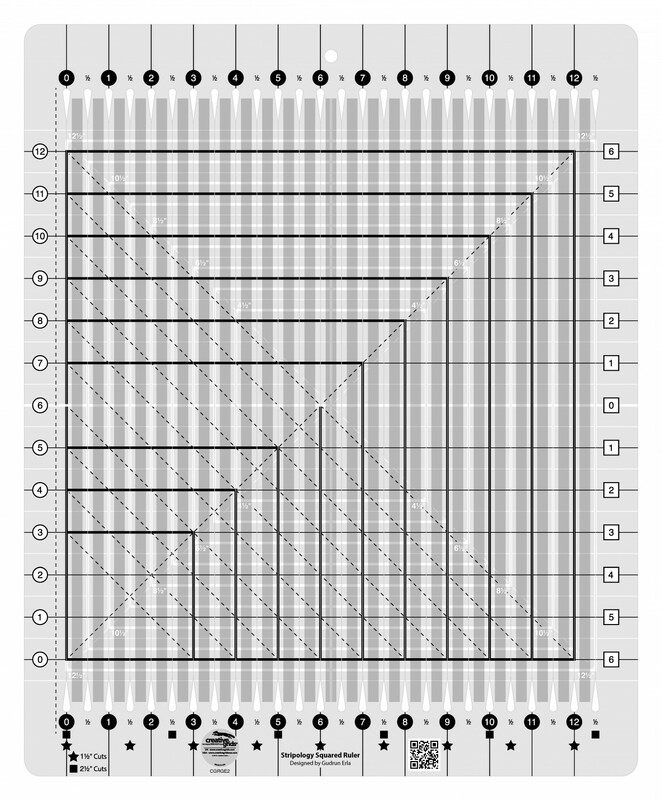 The square is a true 10″ square – not 10 1/2″. 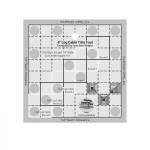 There are additional markings for five inch and two and a half inch squares, as well as the most popular strip widths. Trim half square triangles by placing the diagonal on the seam line. The black and white markings show up on both light and dark fabrics. 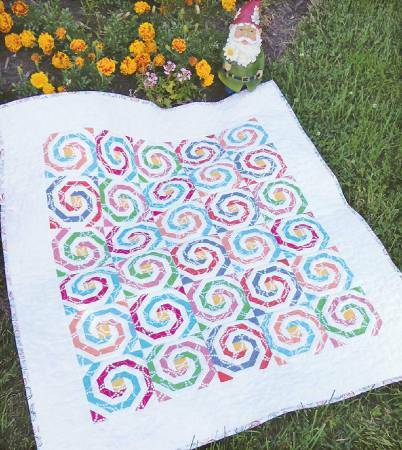 Grab a layer cake – or cut your own – and start one of these quilts today. Square One and Acadia are both Cut Loose Press patterns – a perfect combination. 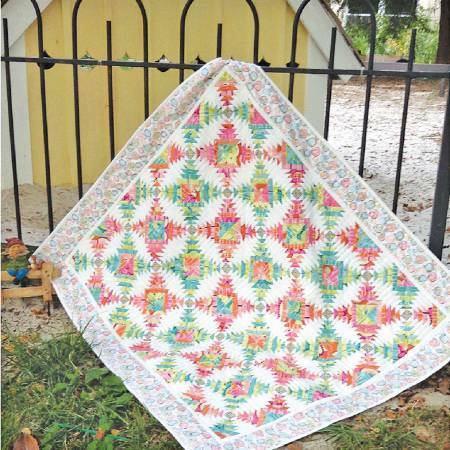 These creative and colorful It Sew Emma Patterns include yardage requirements for multiple sizes. Perfect 10 Quilts is due to arrive next month and includes 16 quilts cut from ten-inch squares. If the cover is any indication, this is going to be a best seller! When you ask, we listen! 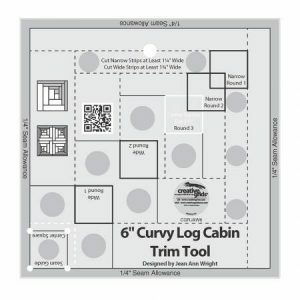 Thousands of you have fallen in love with the six and eight-inch Creative Grids® Curvy Log Cabins that make twelve and sixteenth-inch circles. 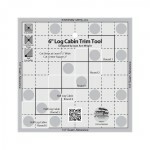 But sometimes smaller is just plain fun so welcome the four-inch Curvy Log Cabin to the family! These smaller blocks are just as fun and easy to make as the other sizes – with even more accentuated curves. Check out the possibilities with these Cut Loose Press™ patterns. Fried Green Tomatoes includes a table runner and a set of place mats. 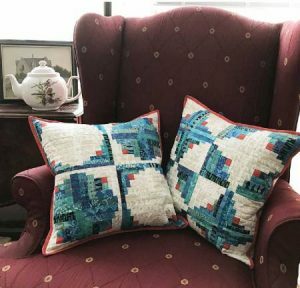 Yin and Yang pillows show how block placement creates a totally different look. Little Runaway Pinwheels below really shows how this smaller size sings! Round the World Tote has an Asian influence. Circle of Love is an unusual setting that shows this block off to its fullest! You already know who will want this one so order them now! Now is a great time to introduce everyone to the Stripology rulers. There are now two versions – Stripology #CGRGE1 and Stripology Squared #CGRGE2. Both feature the exclusive grip that holds the fabric in place while cutting – which eliminates slipping and mis-cuts and special markings for the most popular cuts. 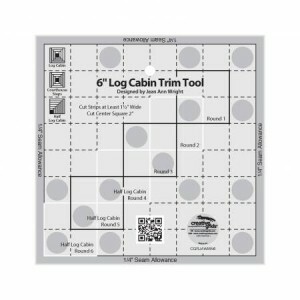 Follow the squares to cut 2 1/2 inch strips and the stars to cut 1 1/2 inch strips – no math required! 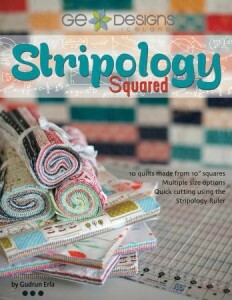 The original Stripology is larger and perfect for cutting fat quarters or fabric folded right from the bolt. It features a marked 10 inch square – perfect for sub-cutting layer cakes. 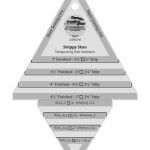 Stripology Squared has all of the features you love in the original Stripology ruler, and it makes ‘squaring up’ a breeze! The smaller size is easier to manipulate and is more portable so it is the perfect choice when traveling to classes and retreats. 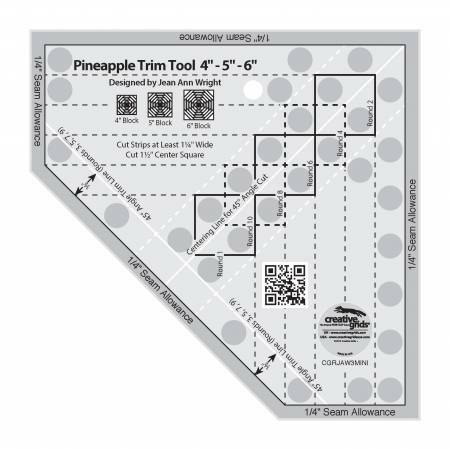 Stripology Squared includes markings to square up half-square triangles, quarter-square triangles, and blocks up to 12 inch. And, since the slots are longer to accommodate larger blocks, it is the perfect choice for cutting wider fabrics. 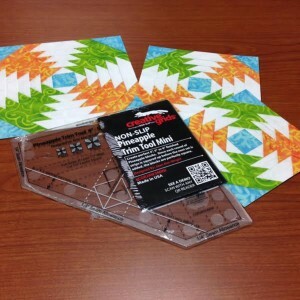 Both rulers are a great choice for quilters who are experiencing weakening in their hands due to carpal tunnel issues, arthritis, etc. The weight of the ruler itself is enough to hold it in place – no additional pressure is required! The perfect demo? The Cut Loose Press™ pattern – Wingman #CLPGER008. 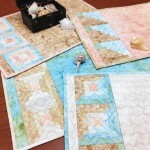 It uses six different 1/3 yard cuts plus a background so it is easy to kit – and even easier to demo since the whole quilt is made from strip sets – cut to size with the Stripology Squared tool. One of the advantages of the tool? It absorbs the seams so there is no teetering like you experience with traditional rulers so the strips are the perfect width every time. 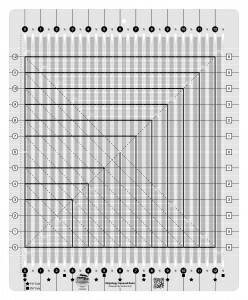 This pattern is a simpler version of one that appears in Stripology Squared #GE-512 and is featured on the back cover – a companion book to both rulers. Once you demonstrate Wingman – and see how easy Gudrun’s techniques are, everyone will want the book! Check out www.checkerdist.com to see all of Gudrun’s designs marketed under GE Designs. Since almost everything features strips, they are great companions for the ruler! The Pineapple Mini has arrived! Minis are all the rage – and they have never been easier! 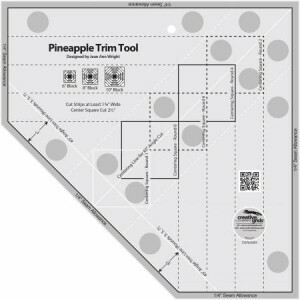 The Creative Grids® Pineapple Trim Tool Mini makes pineapples in 4, 5, and 6 inch sizes. 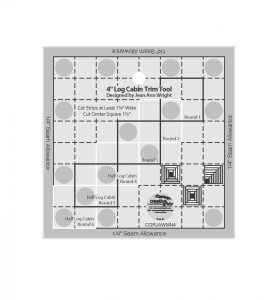 This one inch center with half inch pineapple strips is the perfect companion to the popular four and six inch log cabin trim tools that were the hit of market. This Cut Loose Press™ pattern – South Beach Pineapple Treats is the perfect choice for a traditional pineapple setting with that extra spice added with perfect fabric choices. It creates the illusion of circles. Swirly Pearly Buttons looks similar to a Snail’s Trail with a lot less work – and once again, it is color placement! This one reminds me of those all day suckers I used to beg for at the fair! 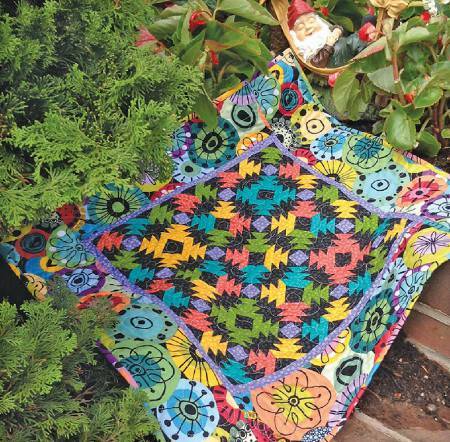 Petite Pineapple Garden features the more traditional black fabric that sets off these happy colors to a tea! Or, you may want to choose this pillow or place mat for a perfect class project that they could actually finish in an afternoon class! Simply stop after six rounds for a four inch size; add two more for the five inch version; or complete all ten for the six inch version. As an added bonus, these strips are cut 1 1/4″ wide – half the width of the popular 2 1/2″ x 12 1/2″ ruler. Therefore you can use that white center line to cut jelly rolls in half and start sewing a multitude of blocks in no time! Don’t forget the original for those who want a larger size. It makes 6″; 8″ and 10″ sizes. 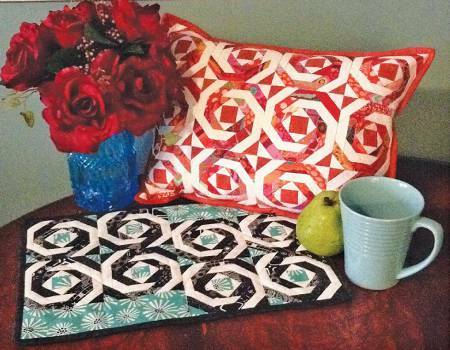 We couldn’t wait to create more Cut Loose Press™ patterns with them. 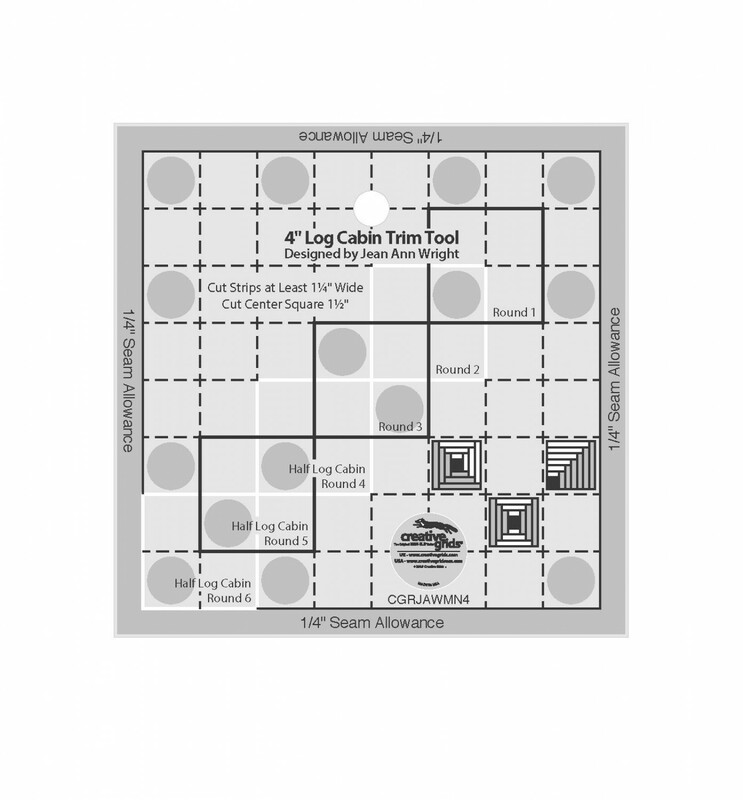 The place mats include instructions to make four different versions of the traditional log cabin block ((#CLPGRG005)- log cabin; courthouse steps; half log cabin; and square in a square. What a great class. 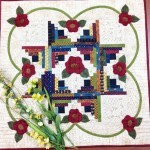 The log cabin pieced into a star measures 24″ square (#CLPGRG006) and includes wool flowers with bias tape stems – created with a Clover bias tape maker. Again, what a great way to introduce your customers to wool applique and a new tool! 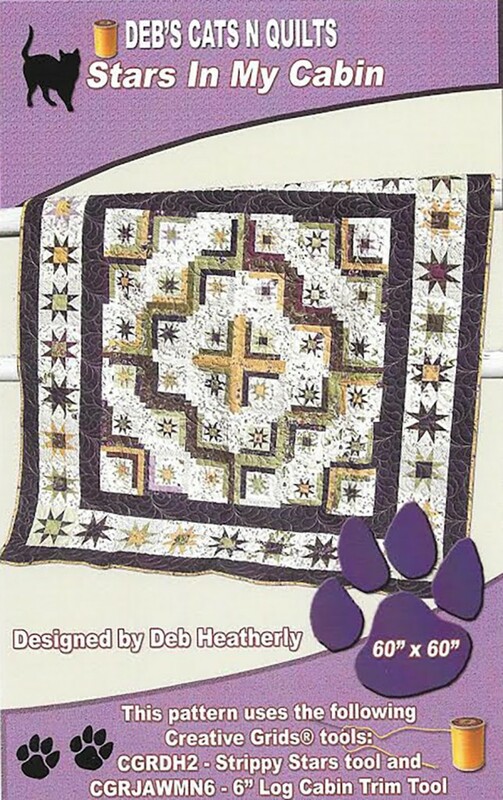 Deb Heatherly, designer of the Strippy Stars Tool immediately saw the potential in combining the tools. 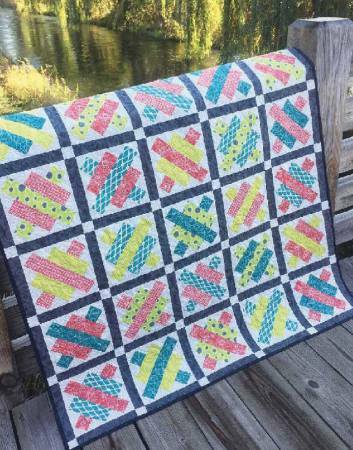 She created this darling mini (#CLPDHE009) that uses the Strippy Stars Tool to create an amazing border to showcase the four inch log cabins. But she didn’t stop there! She combined the six inch log cabin with different sizes of stars to create this stunning beauty. 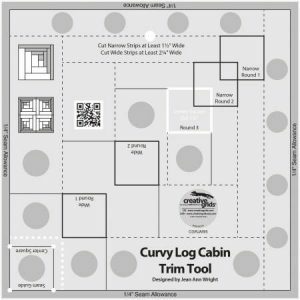 This gives you an opportunity to teach a series of classes – one on the log cabin four, six and eight inch trim tools; one on the strippy stars; and one that combines the tools! 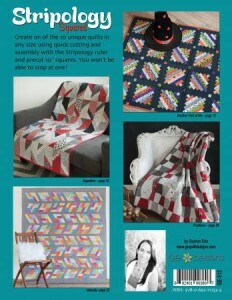 Check out the website to see all of the patterns that support them! 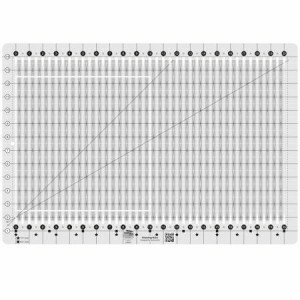 We are thrilled to announce that we are joining forces with Wilmington Fabrics to provide the entire package – their fabric, a Creative Grids® ruler, and a Cut Loose Press™ pattern! The folks at Wilmington have recreated some of our most popular Cut Loose Press™ patterns in their brand new fabric lines. 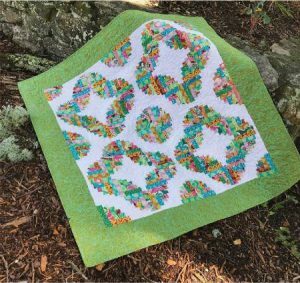 Look for the Trifecta logo at the beginning of the fabric collection and click on it to download the images to display with the fabric, ruler, and Cut Loose Press™ pattern. This Way in Isabella fabrics…. Why not score the trifecta every time by providing a teaching opportunity with every sale? Creative Grids provides that opportunity for your customers to learn a new technique with every purchase! That is the Trifecta advantage! When five out of the top 16 patterns support the Row by Row Experience, you know the biggest event on the quilting calendar is about to begin! This phenomenon has taken the continent by storm with over 2,600 shops participating. 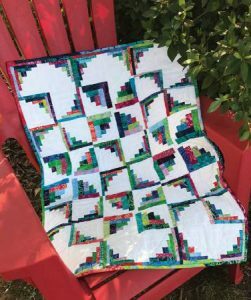 Janet Lutz is the brainchild behind this program and deserves a place in the Quilter’s Hall of Fame – what a creative genius! This darling pin cushion has become the mascot for the program – and provides the perfect opportunity for a photo op. Add your own touch of whimsy to showcase the personality of your store. Sell wool? Feature embroidery? Love beading? Show it off! Sealed with a Stitch has created hree different patterns that showcase the license plates that can be collected at participating shops. 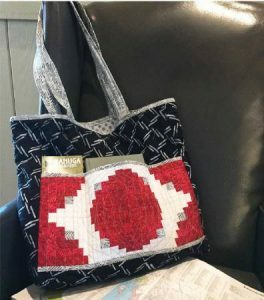 This bag features four license plates – or cut favorite fabrics to that size to make this bag your own. This wristlet pattern is available as a “hoop” project or make it with traditional methods. Whichever you choose, the results are irresistible! 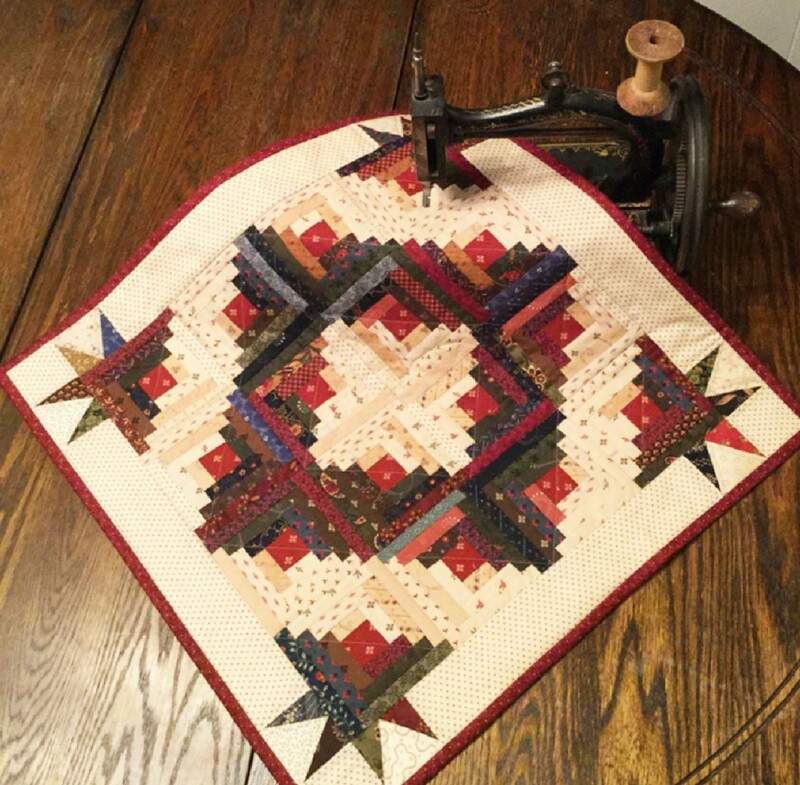 Or make this version completely in the hoop – a perfect demo for a sewing machine shop. 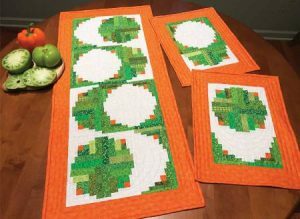 Display your license plate collection in this Cut Loose Press pattern that may also feature your favorite rows. Due to the incredible demand, not all of these patterns are in stock – but huge orders are due in again this week! Please do our buyers a favor and order now so they can predict the demand. Your customers will thank you for it. Curves that would make Marilyn proud! 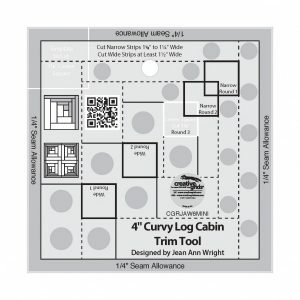 You all loved the 8″ curvy log cabin (CGRJAW5). We immediately had requests for a smaller version – preferably a six inch size so four could be sewn together to create a 12 inch block. You asked – we aim to please! Look at the motion these curves can create – and it is no harder than doing a traditional log cabin! Simply sew narrow strips to two adjoining sides and wide strips to the other two sides! Fly Away with Me looks like white birds are flying in circles. Wiggly Worms is so bright and cheerful, every child will want one. Summer camp anyone?? ?